BEIJING — China's first aircraft carrier was handed over Sunday to the navy of the People's Liberation Army, state press said, amid rising tensions over disputed waters in the East and South China Seas. The handover ceremony of the 300-metre (990-foot) ship, a former Soviet carrier called the Varyag, took place in northeast China's port of Dalian after a lengthy refitting by a Chinese shipbuilder, the Global Times reported. During the handover ceremony the aircraft carrier raised the Chinese national flag on its mast, the PLA flag on its bow and the navy's colours on its stern, the short online report said. A ceremony to place the ship into active service would be held sometime in the future, the paper said without elaboration. China's defence ministry was unavailable to comment on the ceremony. The announcement comes at a time of heightened tensions over maritime disputes in the Asia-Pacific region, where China's growing assertiveness has put it on a collision course with Japan, Vietnam and the Philippines. China also Sunday postponed a ceremony marking the 40th anniversary of the establishment of diplomatic ties with Japan, due to a noisy territorial dispute with Tokyo over the Diaoyu Islands, known in Japanese as Senkaku. Tensions have also risen this year with Vietnam and the Philippines over disputed islands in the South China Sea. 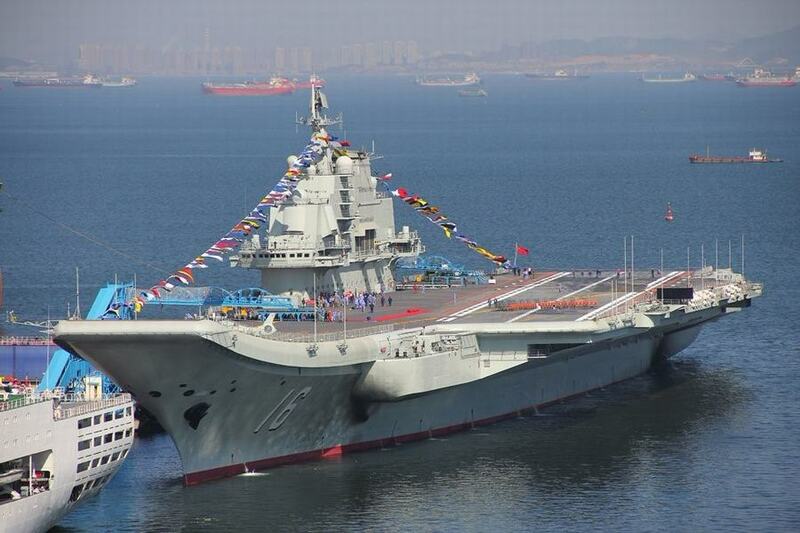 Beijing confirmed last year it was revamping the old Soviet ship, and has repeatedly insisted the carrier poses no threat to its neighbours and will be used mainly for training and research purposes. But numerous sea trials of the aircraft carrier -- currently only known as "Number 16" -- since August 2011 were met with concern from regional powers including Japan and the United States, which called on Beijing to explain why it needed an aircraft carrier. Construction of the Varyag originally ended with the 1991 collapse of the Soviet Union. China reportedly bought the carrier's immense armoured hull -- with no engine, electrics or propeller -- from Ukraine in 1998 and began to refit the vessel in Dalian in 2002.